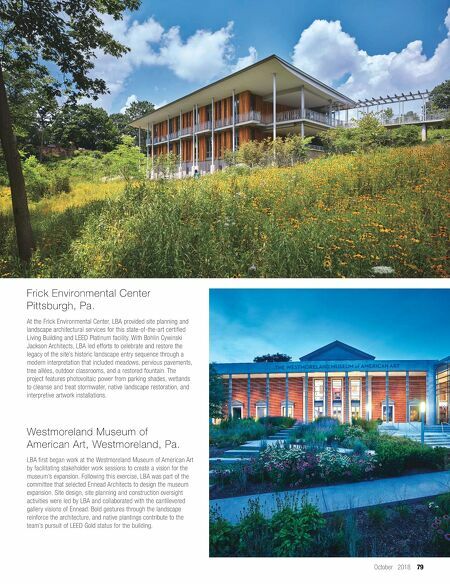 October 2018 79 Frick Environmental Center Pittsburgh, Pa. At the Frick Environmental Center, LBA provided site planning and landscape architectural services for this state-of-the-art certified Living Building and LEED Platinum facility. 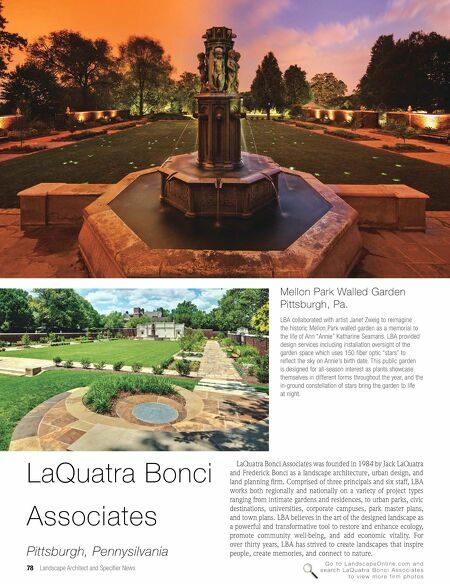 With Bohlin Cywinski Jackson Architects, LBA led efforts to celebrate and restore the legacy of the site's historic landscape entry sequence through a modern interpretation that included meadows, pervious pavements, tree allées, outdoor classrooms, and a restored fountain. The project features photovoltaic power from parking shades, wetlands to cleanse and treat stormwater, native landscape restoration, and interpretive artwork installations. Westmoreland Museum of American Art, Westmoreland, Pa. LBA first began work at the Westmoreland Museum of American Art by facilitating stakeholder work sessions to create a vision for the museum's expansion. Following this exercise, LBA was part of the committee that selected Ennead Architects to design the museum expansion. Site design, site planning and construction oversight activities were led by LBA and collaborated with the cantilevered gallery visions of Ennead. Bold gestures through the landscape reinforce the architecture, and native plantings contribute to the team's pursuit of LEED Gold status for the building.